Saoirse Evelynn Cleary with her parents Emma and Michael oh her bsptidm dsy. Tess May Keavey on her baptism day with her parents Julia and Anthony. Aoibhín Mary Browne on her baptism day with her parents Assumpta and Andrew. Lorcan O’Halloran with his parents Angela and Padraig on his baptism day. Elisabeth Rita Hanrahan on her baptism day with her parents Jennifer and Anthony on her baptism day. Adam Michael Quinn on his baptism day with his parents Sheila and Seamus Quinn, Boloughera and sister Amy. Olivia Mary Meaney with her parents, Bernie and Alan, on her baptism day. Amelia Annie Corry with her parents Aoife and Alan on her baptism day. Kalya Irene Power with her parents Irene and Albert and Gavin & Jodie on her baptism day. Doireann Lily O’Connell on her baptism day witn her parents Stephanie and Gareth. Iarla Shannon ÓCeallaigh with his parents Úna and and Barry on his baptism day. Sophie Ella with her parents on her baptism day. Leah Emily Cleary with her parents Fiona and Patrick on her baptism day. We welcome Tess May Keavey into our family of faith and congratulate her parents Julia and Anthony. Tess was baptised in St Mary’s Church, Cranny on 28 December, 2017. We welcome Doireann Lily O’Connell into the family of faith and congratulate her parents Stephanie and Gareth. Doireann was baptised in St Benedict’s Church, Coolmeen on 28 December, 2017. We welcome Darragh Alan Kelly into the Christian family and congratulate his parents Fionnualla and Anthony, Terenure, Dublin. Darragh was baptised in St Benedict’s Church, Coolmeen on 23 December, 2017. We welcome Saoirse Evelynn Cleary into the Christian family and congratulate her parents Emma and Michael, Gortnafrehane. Soairse was baptised in St Benedict’s Church, Coolmeen on 23 December, 2017. We welcome Elizabeth Rita Hanrahan into the Christian family. Elisabeth was baptised in St Benedict’s Church, Coolmeen on Sunday 22 October, 2017. We congratulate her parents Jennifer and Anthony, Erribul amd pray God’s blesing on the family. We welcome Adam Michael Quinn into the Christian family. Adam was baptised in St Mary’s Church, Cranny on Sunday, 10 September, 2017. We congratulate his parents Sheila and Seamus, Boloughera and pray God’s blessing on the family. We welcome Leah Emily Cleary into the family of faith. Leah was baptised in St Benedict’s Church, Coolmeen on Sunday, 27 August, 2017. We congratulate her parents Fiona and Patrick, Erribul, Coolmeen and pray God’s continued blessing on the family. We welcome Kayla Irene Power into the Christian family. Kayla was baptised om Saturday, 29 July in St Benedict’s Church. Coolmeen. We congratulate her parents Irene & Albert, Shanahea Beg and pray God’s contimued blessimg on the family. We welcome Aoibhín Mary Browne into the Christian family. Aoibhín was baptised on Sunday, 16 July 2017 in St Benedict’s Church, Coolmeen. We congratulate her parents, Assumpta and Andrew, Dublin and pray God’s blessing on the family. We welcome Olivia Mary Meaney into the Christian family. Olivia was baptised in St Mary’s Church, Cranny on Sunday, 11 June. We congratulate her parents Bernie and Alan, Boloughera and pray God’s blessing on the family. We welcome Amelia Annie Corry into the Christian family. Amelia was baptised in St Benedict’s Church, Coolmeen on Sunday, 28 May, 2017. We congratulate her parents Aoife and Alan, Coolmeen and pray God’s bleasing on the family. We welcome Sophie Ella Stephens into the Christian family. Sophie was baptised in St Mary’s Church, Cranny on 11 February 2017. We congratulate her parents Bernie and Cyril, Birrinfadda and pray God’s blessing on the family. We welcome Iarla Shannon Ó Ceallaigh into the Christian family. Iarla was baptised in St Mary’s Church, Cranny on Sunday, 29 January, 2017. We congratulate his parents Úna and Barry, Cranny and USA and pray God’s blessing on the family. We welcome Lorcan Thomas O’Halloran into the Christian family. Lorcan was baptised in St Mary’s Church, Cranny on 7 January, 2017. We congratulate his parents Angela and Padraig, Birrinfadda and pray God’s blessing on the family. Caroline and Alan on their wedding day. Edel and Kevin on their wedding day- 7 July, 2017. Kevin and Linda on their wedding day. Edel and PJ on their wedding day. Sinead and Ian on their wdding day. We congratulate Sinead O’ Neill, Erribul and Ian Henry who celebrated the sacrament of marriage in St Benedict’s Church, Coolmeen on Wednesday, 27 December, 2017. May the Lord alwasy bless atheir marriage and their family. We congratulate Fiona Griffin, Erribul and Michael Malone who celebrated the sacrament of marriage in the Church of St Isadore, Rome on 12 October, 2017. May the Lord blessw their marriage and their home. We congratulate Caroline Marrinan, Cranny & Alan Healy Doonbeg who celebrated the sacrament of marriage in St Salvador’s Chapel, St Andrews, Scotland on 16 July, 2017. We congratulate Edel Keane, Clonsnaughta and Kevin McMahon, Gurtnafrehane who celebrated the sacrament of marriage in St Michael’s Church, Kildysart on Friday, 7 July 2017. We congratulate Kevin McMahon, Clondrina and Linda Earlie, Ennis who celebrated the sacrament of marriage in Ennis Cathedral on 12 May, 2017. We congratulate Edel Meaney, Boloughera and P.J. Connaghan, Doolin who celebrated the sacrament of marriage in St Mary’s Church, Cranny on Friday, 28 April, 2017. 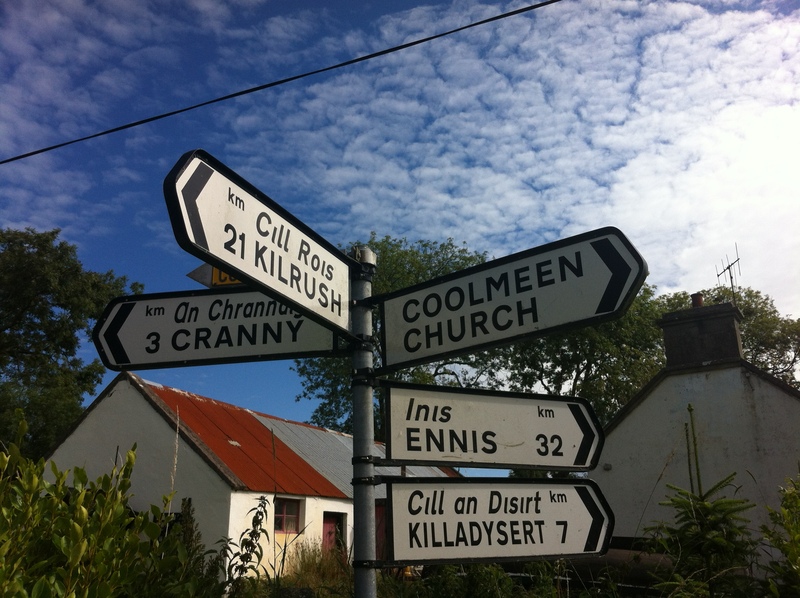 The Church choirs from Coolmeen and Cranny will lead us in a service of readings and Christmas carols in St Mary’s Church, Cranny on Saturday 16 December at 6.30pm. All are welcome to attemd and to take part. 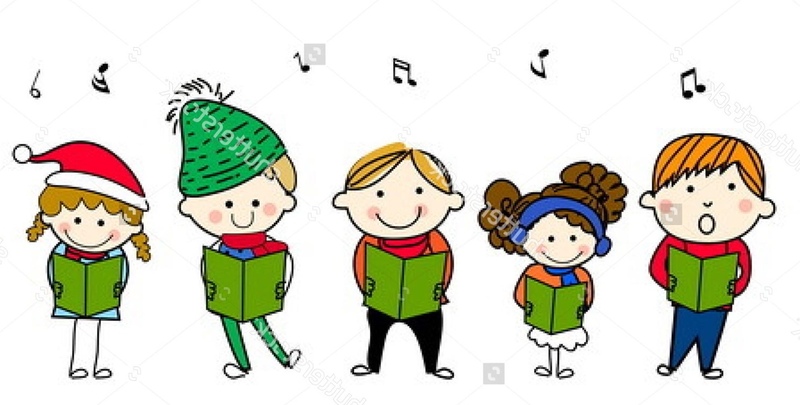 Members of our Church choirs and friends will sing Christmas carols after 9am Mass in St Benedict’s Church, Coolmeen on Sunday, 17 December. The proceeds wil be used to fund Christmas decorations, including the Christmas tree in Coolmeen. 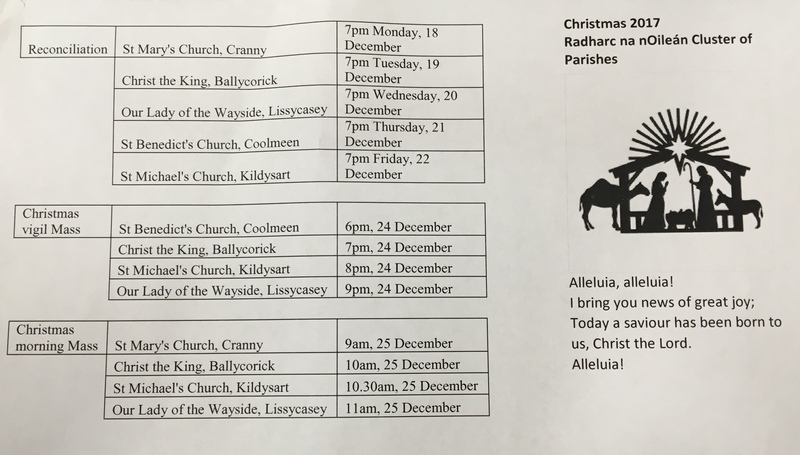 Our parish choirs will sing Christmas carols after 9am Mass on Christmas morning in St Mary’s Church, Cranny, The proceeds will will be donated to West Clare Cancer Services.